Kong, X., Luo, Z. and Dong, H. (2017). Establishment of New Split-root System by Grafting. Bio-protocol 7(4): e2136. DOI: 10.21769/BioProtoc.2136. 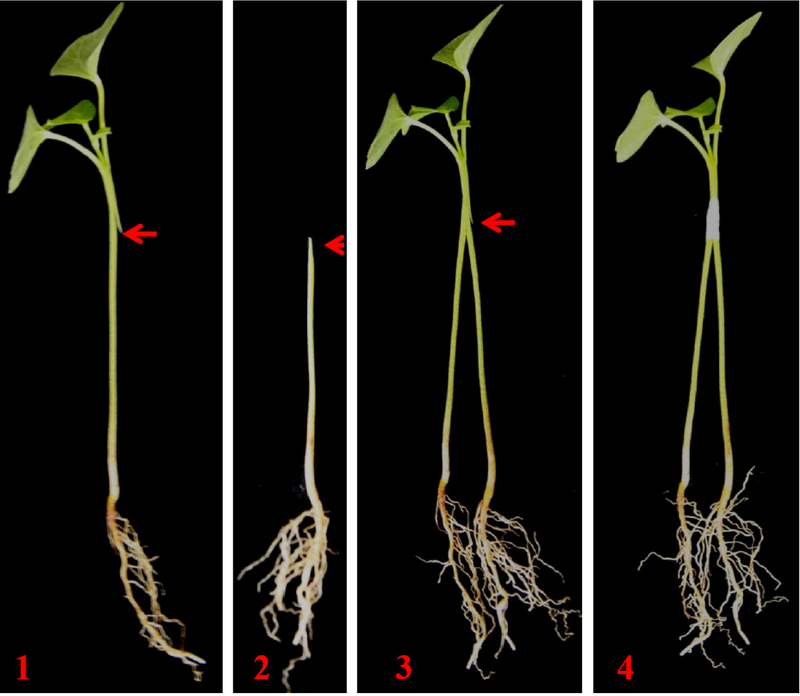 A new split-root system was used to simulate non-uniform salt, drought or nutrient deficiency stress in the root zone, in which the root system was divided into two or more equal portions. Here, we established a split-root system by grafting of cotton seedlings. In contrast to the conventional split-root, the main roots of the new system remained intact, which provided a better system for studying cotton response to unequal treatment in the root zone. The new system was suitable for plant growth in nutrient solution and the two root systems can fully be immerged in the nutrient solution. The split-root system has been used to study plant responses to heterogeneous soil conditions such as partial root drying, unequal salt distribution, and heterogeneous nutrient distribution. 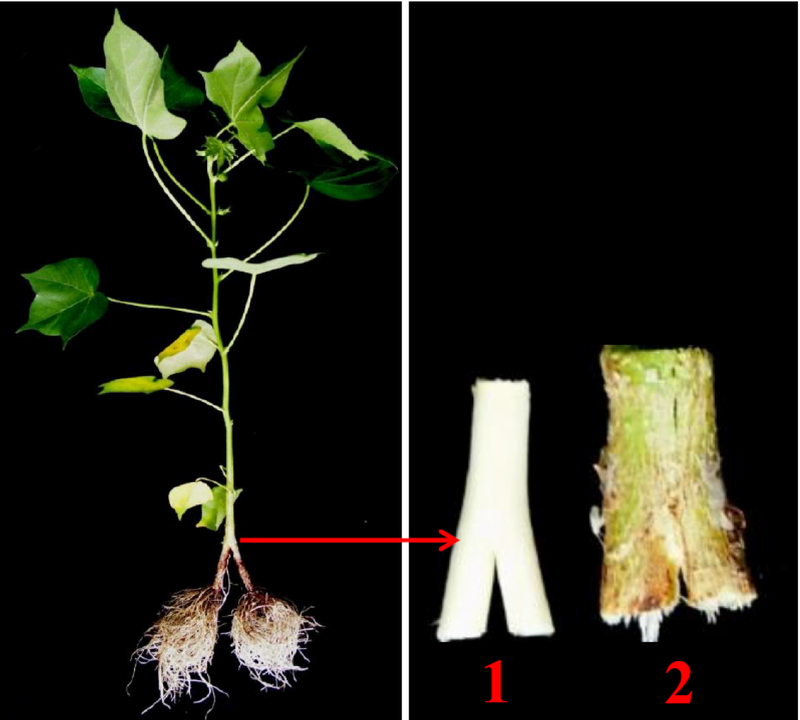 The conventional split-root system in cotton and other plants are established by dividing the lateral roots into two equal parts after cutting of the main root of a seedling (Bazihizina et al., 2009; Dong et al., 2010). The new system was suitable for plant growth in nutrient solution and for a girdling experiment because there was sufficient distance between the root and position of the graft (Kong et al., 2012 and 2016). Treat cotton seeds with concentrated sulfuric acid for 2-3 min and then wash the seeds with flowing tap water for 6 times. After that, the wet seeds are dried in a hot air stream (50 °C) for 8 h.
Sow the acid-delinted seeds at approximately 3 cm depth in plastic boxes (60 x 45 x 15 cm) containing sterilized wet sand. Place the boxes in a growth chamber with light/dark regimes of 16 h/8 h, light intensity of 400 µmol m-2 sec-1 PAR, and temperature of 28-32 °C and relative humidity of 60-70%. Thin the seedlings to 100 plants per box at full emergence at 10 days after planting. When most seedlings reach the 2-true leaf stage (Figure 1-1) at 15 days after planting, carefully pull the uniform seedlings (the seedlings which germinate at the same day and have same plant height, leaf number and leaf area) out from the sand and wash the seedlings with water to remove all the sand. Note: Don’t irrigate the seedlings for about 3 days before grafting in order to remove the seedlings easily and induce root growth. Establish split-root systems through grafting with seedlings (Figure 1). Briefly, make a ‘/’ shaped incision with a blade on the hypocotyl 2 cm below the two cotyledons, leaving about 1/3 of the hypocotyl tissues intact. The angle between the ‘/’ shaped incision and the hypocotyl is about 60°. Cut the top of the rootstock to form a deep ‘ʌ’ at the same position of the hypocotyl from another seedling. The ‘ʌ’ section is then inserted into the ‘/’ incision of the plant and closely wrap the seedlings with Parafilm. Figure 1. Schematic diagram of the sequential steps of the graft split-root system. 1. Scion; 2. Stock; 3 and 4. Grafted cotton. 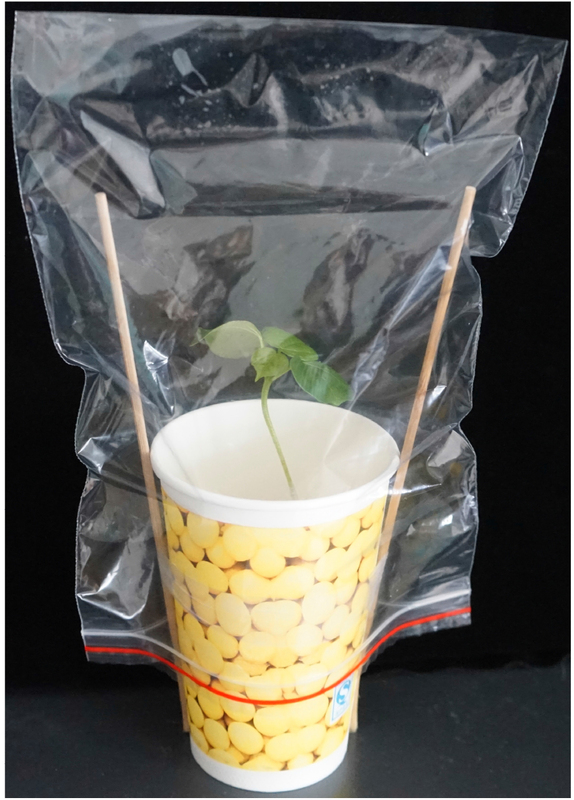 Transfer grafted seedlings into disposable cups containing aerated nutrient solution, spray the seedlings with water and immediately cover them with plastic bags to prevent wilting (Figure 2). The air is introduced into the nutrient solution by the aeration instrument to maintaining oxygen concentration in the nutrient solution. We top the nutrient solution with deionized water every day instead of changing the whole nutrient solution, as the grafted seedling uptake a little water and nutrient each day. When a new leaf emerged from the grafted seedling at one week after grafting, remove the plastic bags and Parafilm (Figure 3). Transfer the grafted seedlings with two uniform split-root systems into a growth chamber under 28-32 °C and 60-70% relative humidity for 20 days. Renew the nutrient solutions daily during the period of growth. The survival rate of grafted seedlings was more than 95% and most of them had two uniform root systems (kong et al., 2012) (Figure 4). A successfully grafted cotton seedling has two uniform root systems. At this stage, the seedling which was used as scion becomes indistinguishable from the stock. Figure 4. Grafted cotton. The xylem (1) and phloem (2) of the grafted site. Uniformly germinated seeds and seedling were selected to make sure the grated seedlings had two uniform split-root systems. Note: The nutrient solutions used in this experiment needn’t be sterilized. It can be made in advance and stored at 4 °C for one month. This work was supported by the National Natural Science Foundation of China (Grant Nos. 31371573 and 31501249), the special fund for Taishan Scholars (Nos. Tspd20150213 and tshw20110218), the Natural Science Foundation of Shandong Province (ZR2015QZ03), the Seed Project of Shandong Province (2014-cotton), the Agricultural Scientific and Technological Innovation Project (CXGC2016C04) and Youth Scientific Research Foundation (Grant No. 2014QNZ01) of Shandong Academy of Agricultural Sciences. Kong, X., Luo, Z., Dong, H., Eneji, A. E. and Li, W. (2012). Effects of non-uniform root zone salinity on water use, Na+ recirculation, and Na+ and H+ flux in cotton. J Exp Bot 63(5): 2105-2116. Kong, X., Luo, Z., Dong, H., Eneji, A. E. and Li, W. (2016). 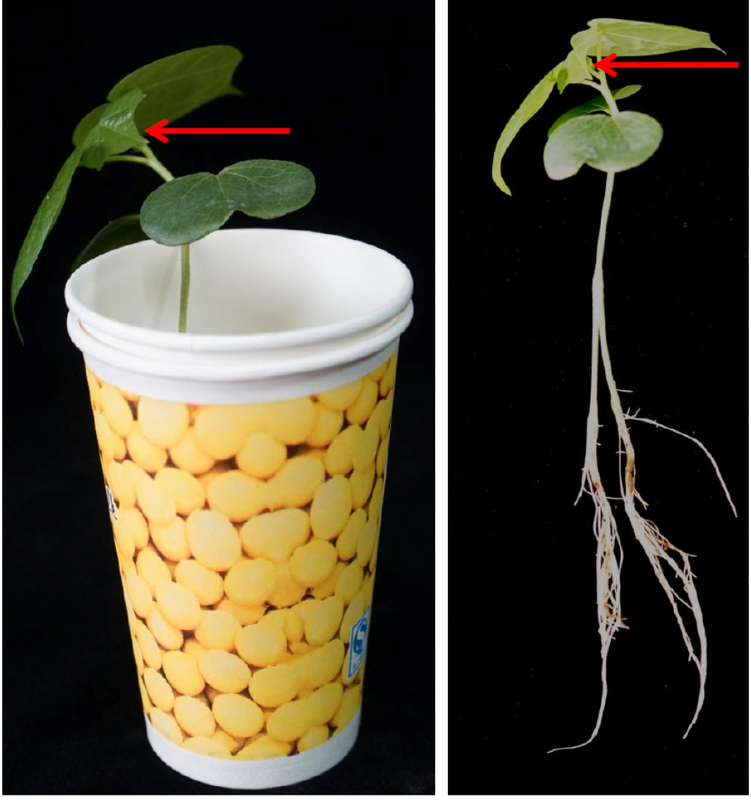 H2O2 and ABA signaling are responsible for the increased Na+ efflux and water uptake in Gossypium hirsutum L. roots in the non-saline side under non-uniform root zone salinity. J Exp Bot 67(8): 2247-2261. Bazihizina, N., Colmer, T. D. and Barrett-Lennard, E. G. (2009). Response to non-uniform salinity in the root zone of the halophyte Atriplex nummularia: growth, photosynthesis, water relations and tissue ion concentrations. Ann Bot 104:737-745. Dong, H. Z., Kong, X. Q., Luo, Z., Li, W. J. and Xin, C. S. (2010). Unequal salt distribution in the root zone increases growth and yield of cotton. Eur J Agron 33: 285-292. How to cite: Kong, X., Luo, Z. and Dong, H. (2017). Establishment of New Split-root System by Grafting. Bio-protocol 7(4): e2136. DOI: 10.21769/BioProtoc.2136.